Since its launch in 2012, Quartz has focused heavily on video: the creation of a video lab, screening works at the Sundance Film Festival in Park City and winning awards, like the SABEW Best in Business Video. In all, Quartz’s videos have been viewed over 1 billion times. While Facebook Watch’s viewership numbers disappointed some publishers, betting that Quartz may thrive in that environment isn’t a risky one. Following other outlets like McClatchy and BuzzFeed, Quartz last week launched a new series, called "Quartz News," that focuses on the global economy, to screen exclusively on the platform. 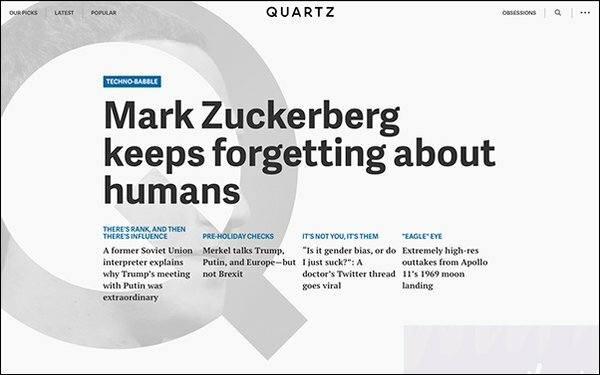 A bot created by the Quartz Bot Studio accompanies the series, enabling viewers to see surfacing headlines while chatting or taking part in quizzes. Users can also send images taken worldwide to Quartz editors. The bot is accessed through Facebook Messenger. In a memo, Kevin J. Delaney, Quartz editor in chief, lauded the new series as the outlet’s attempt to “reimagine video news, in ways that are smarter, more boldly visual, and genuinely global,” while taking advantage of the interactivity digital platforms offer. The first episode, called “Why Oppressive Rulers Love Cryptocurrency,” focuses on Venezuela. The country is a hotbed for the “libertarian cryptocurrency dream,” as Venezuelans attempt to free themselves from a controlling state power. Story highlights include a visit to an underground bitcoin operation in Caracas, where Quartz interviews the operator risking prison for such activities. Next up is an episode about life in China behind the Great Firewall. The first episode is available via Facebook Watch or beneath Delaney’s post.